110 VOLT AND 220 VOLT OPTIONAL! 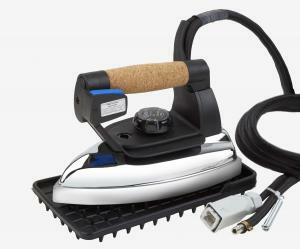 To get professional quality results you need a professional quality iron. The 2100IR series irons are designed to provide quality dry steam, while being comfortable for the operator to use. The 2100IR irons incorporate a die-cast aluminum plate with 32 separate steam chambers, which eliminates condensation even when used with an extra long steam hose. Very good value for the price and an easy buying experience. I'll be a repeat customer. This is a great ironing system. We use this iron i500 in our retail linen shop. After 4 years of heavy use we needed to replace the iron. Fast shipment. We have tried several different brands of irons and this one is the best. Great water capacity!! Great steam with no spots of water or spitting of water while you are ironing to cause damage to expensive fabrics! !